Tomato sauce is not the same as marinara. Say it with me – tomato sauce is not the same as marinara. If there is one thing that was made clear to me this week, it was this very point. On Tuesday night we made tomato sauce, as in one of the five mother sauces – not marinara. You can make marinara from tomato sauce, but it is NOT marinara sauce. Everyone clear on that point now? Good, let’s move on. 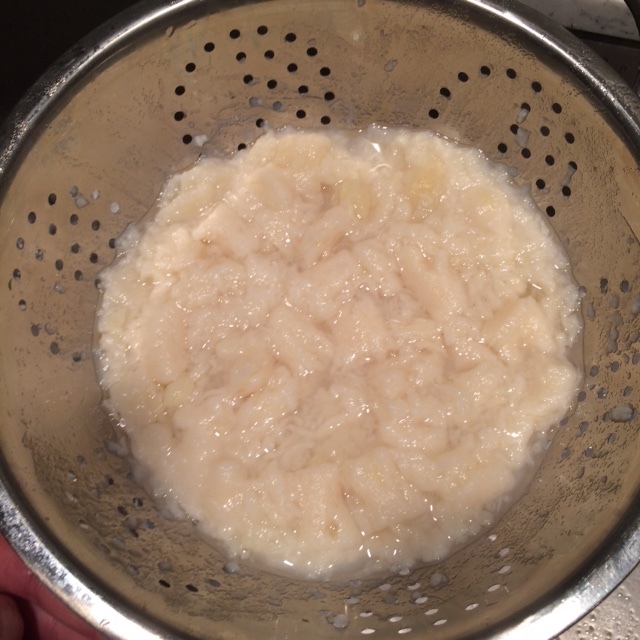 Exhibit A – gnocchi mush. Typically, our weekend is planned around “what’s for dinner”, and this weekend was no exception, even with the holiday mixed in. Inspired by my latest issue of Bon Appetit and the amazing tomato sauce I had left over from class, I figured why not make gnocchi! Well, the culinary gods had other ideas. The sauce was not the issue, it was the gnocchi that foiled the plans. It started out easy enough, but I think I may have over cooked it because it turned in to a big mush ball. See exhibit A. Time for plan B. This dish was always about the sauces to begin with, so all I had to do was get another pot of water going and boil whatever pasta I had in the house, which turned out to be about a cup of cavatapi and some lasagna. That’s not much but it would work.